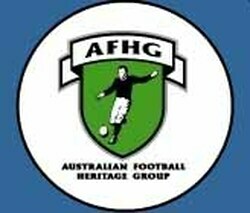 For the 1879-80 intercolonial matches the South Australian side wore "the Association colours -- blue with SAFA on cap". [Register 21-6-1879] This all-blue uniform made its first appearance on June 20, 1879 when the colonial side played a practice match against a scratch team of 25 Association players at the Adelaide Oval. The South Australians wore red, white and blue jerseys/hose/caps with navy blue knickerbockers [The Argus 4-7-1890]. The Leader [12/7/1890] describes the lace-up jacket as "tricoloured". These descriptions match that of the uniform originally worn by Victoria against South Australia from 1879 to 1881. A black lace-up jacket with two white braces (and a partial white brace running down each side of the jersey). The decision to adopt the new design was made at the South Australian Football Association meeting held on Tuesday May 12th. The Australasian [16-5-1891] reported: "For this year's intercolonial football matches in Adelaide in June, it was decided that the South Australian team should play in black and white jerseys and caps, white knickers and black hose... a costume suggestive of an undertaker." 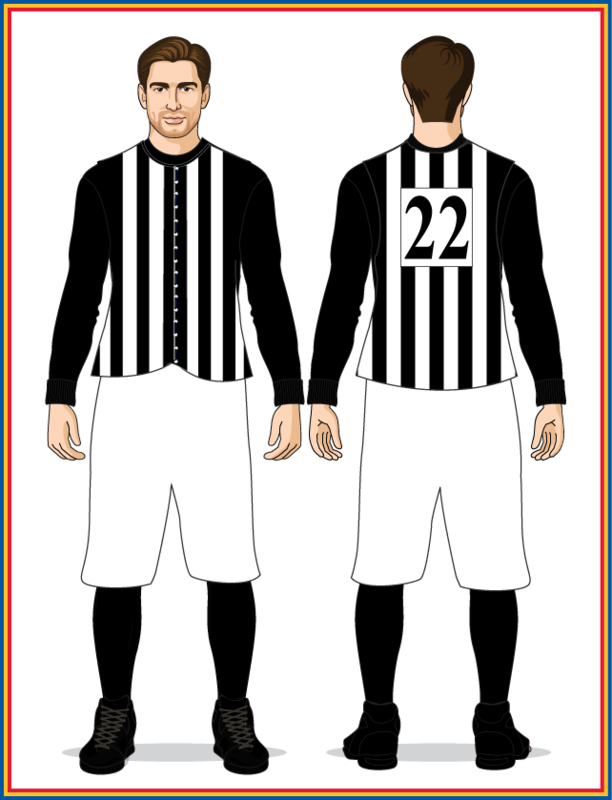 NOTE - the Collingwood Football Club was formed on February 12th, 1892 and adopted a black and white striped jumper... nine months after the S.A.F.A. unveiled their design. Coincidence? In 1899 intercolonial football against the Victorians resumed after a four-year absence. The two white braces on the black jacket became four white stripes but otherwise the South Australian uniform design remained unchanged. Over the next eight seasons the jacket was most commonly worn over a short-sleeved white undershirt. However, many players wore a long-sleeved black undershirt instead, and a small number went without one. As can be seen above the presence and colour of the undershirt creates three very distinct looks for this uniform. This striped jacket made its final appearance on June 8, 1907 when the South Australian 1st XVIII played the VFA in Melbourne and the 2nd XVIII played the Barrier Ranges FA in Adelaide. A dispute between the VFL and the South Australian Football Association (SAFA) in 1904 over gate takings saw the South Australians call an end to interstate matches between the two bodies that season. The VFA seized on this opportunity, initiating annual matches against the SAFA starting in 1905. - 1905: Port Melbourne wore numbers throughout the season. For the return match played in Adelaide the teams reverted to their standard number-less uniforms. Jumper numbers would not officially return at the top level until the 1911 National Carnival, and later that season during the 1911 VFL finals series. In 1912 both the VFL and the VFA mandated the permanent use of numbers on all club jumpers (for more on this topic refer to Trevor Ruddell and David Allen's article Centenary of Numbers [The Yorker, Issue 45, Spring 2011]). In the aftermath of the June 1907 matches against the VFA and the Barrier Ranges FA, the South Australian Football Association started a push for all of the major sporting bodies in the State to adopt a uniform set of colours for interstate matches. However, the initiative had support in some quarters (see below) but garnered little interest within the sporting community. "There is a movement now on foot to secure the adoption of uniform colours for all athletic teams representing South Australia. This practice already obtains in N.S.W. , and S.A. should not be long in coming into line. On a recent occasion when a team of S.A. footballers played Broken Hill, one might have judged, from the dismal [black and white] colours of the Adelaide team, that they were in mourning for their comrades who had gone to Melbourne. " "Recently the question was raised whether it would not be feasible to have specific colours for all sports combinations representative of the State. It was decided as an experiment to adopt purple and white in place of the old black and white, and these were worn for the first time by a local interstate eighteen. Judging by the admiring terms in which the colours were referred to by the spectators, they will no doubt be finally accepted." "The South Australians sported the new jerseys, which, it is suggested, should be generally adopted, and representatives of cricket, lacrosse, lawn tennis, and rowing were invited to express their opinions on the colours... the combination of colours was adjudged to be excellent." However, not everybody was ready for change; the following is taken from the same article of 3rd August quoted above: "It is understood the cricket association is averse to abandoning its beloved red, yellow, and black colour scheme." The same Evening Journal article also notes that the Australian lacrosse team had temporarily adopted green and gold to avoid a clash with the visiting Canadian team who wore purple and white. Purple at this time was associated with royalty and the uniforms worn on the Adelaide Oval had been well received, yet in the months following the SAFA's interest in the topic waned. It was not until a renewed push in February 1908 that a change was finally made.